Valentines Day, for many, is a time dedicated to romance between two individuals and their shared connection. Romance can also exist between two ideas or creations. 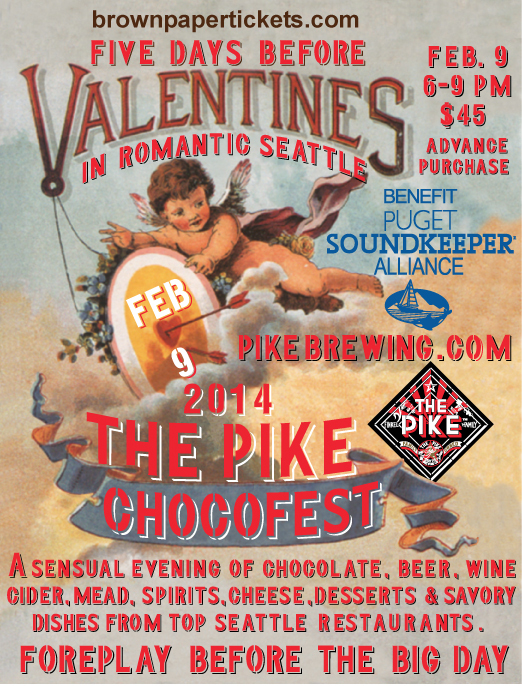 Such is the case for chocolate and beer according to Pike Brewing Company’s annual affair Chocofest. This annual event has been running for six years and continues to make attendees get all mushy. Tags: 3rd Annual Aret Y Tapas Valentine's Day, Andrew Coker, Arte Y Tapas, Chocofest 2013, Eric Friedrich, Fado Irish Pub, food, Foodie Friday, House of Matthew, Lovage Cooking, Patrick Nelson, Pike Brewing Company, Puget Soundkeeper Alliance, Serious Soul Cafe, St. Valentine's Day 3-Course Dinner, The Backdoor, Valentine's Day, Valentine's Day in Fremont's Most Romantic Dining Room, Valentine's Day Red Carpet Event, VIE Winery, Whitney Myer, Wine & Grill on Valentine's Day at VIE Winery.